2. What do you like and not like about your present kitchen? 3. How many people will be using the kitchen? 4. Do you want dining space in the kitchen? 5. Do you do a lot of entertaining? 6. Will you use the kitchen for other activities besides preparing food? 7. What type of storage will you require? 8. What are your appliance preferences? 9. What are your shopping preferences? 10. How do you like to cook? 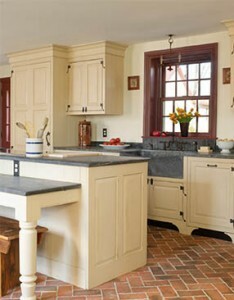 Soapstone “works” beautifully in every kitchen design. Industrial meets Traditional with Soapstone. 2. What color palette do you prefer? 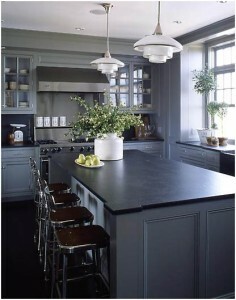 Soapstone’s organic look and feel makes it the natural choice for your color scheme. 3. What materials do you prefer? 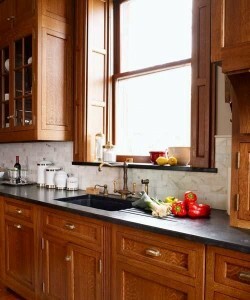 Soapstone mixes comfortably and easily with all high quality materials from stainless steel to the warmer metals, with natural wood finishes as well as painted cabinets.